After impressive performances in the 2017 Currie Cup, Dyantyi made his Super Rugby bow for the Lions earlier this year, scoring seven tries in 15 games which caught the eye of South Africa coach Rassie Erasmus. 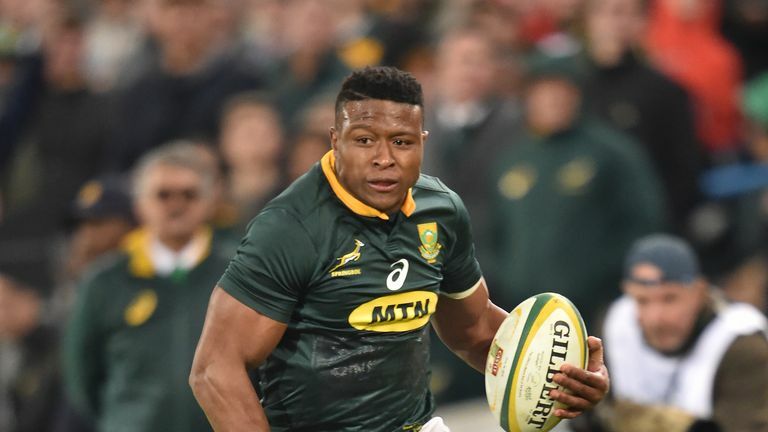 Erasmus handed Dyantyi his international debut in June, and the winger has since scored six tries in nine Tests - including two in the famous win over the All Blacks in Wellington in September - and on Saturday he starts for the Springboks in their clash with England at Twickenham, live on Sky Sports Action from 2pm. Dyantyi's incredible rise to prominence saw him last month named as one of three nominees for Breakthrough Player of the Year, along with New Zealand's Karl Tu'inukuafe and Ireland's Jordan Larmour. It's been a dream first season at the top for the 24-year-old, making it all the more incredible to think it almost didn't happen after Dyantyi walked away from the game when he finished school. Dyantyi had played representative rugby for Eastern Province in primary school, and at the beginning of his high school career at Dale College in the Eastern Cape he featured in all the age group 'A' sides, but in his final year he found himself playing fly-half for the school's third team. "I'll be the first to say, the guys that were playing ahead of me were very good," Dyantyi told Sky Sports. "The fly-half that was playing for the first team, he went on to get provincial colours. "I never really complained about him playing ahead of me, the thing that got me down was that I was never given the opportunity." Given his boyhood dream of making it as a professional rugby player, it was a difficult situation for Dyantyi to accept. "They were questions that I couldn't answer. I sat down with my family and I told them 'I don't think this rugby thing is going to work'. I continued to play for the third team, but I never really played with the same passion. "I don't think I ever fell out of love with the sport, but I felt like my fortunes of playing and being part of the sport in that regard had come to an end." Dyantyi left Dale College at the end of 2011 and headed for the University of Johannesburg to study marketing, preparing himself for life after rugby. "Three of my brothers were already in Johannesburg; they work there," Dyantyi continued. "So what better place to start over again and start focusing on my studies?" Working for the University of Johannesburg (UJ) at the time was former Springbok Sevens player Mac Masina, who was in charge of the Under-19 team and therefore tasked with identifying young talent. "When the season starts, you're always looking for players," Masina told Sky Sports earlier this week. "I was looking for players that could play the way I want to play the game. I like the players that like to express themselves, and I like players who aren't scared to try things." Masina said a conversation with colleagues led him to giving Dyantyi a call, even though the pair had never met. "Someone told me there was a guy who plays rugby and was from the Eastern Cape - once I heard he was from the Eastern Cape, I knew he could play. "I gave him a call, I said 'Come, you're invited, you're being selected to be in the squad for the UJ team'. He said 'Yes, Coach, I'll come', but he never pitched. "I then met him by chance at another university's social event a few weeks later. I asked him why he hadn't come to practice, and he said 'Actually, I'm not interested in rugby, I'm planning to leave rugby, but don't worry, I'm still going to come'. "I waited, and he didn't pitch." Dyantyi's reluctance to play rugby was only in a competitive sense; he had been running out for his university residence's social team. In his own words: "All they had to do to entice me was tell me that afterwards we would enjoy a couple of beers and go out on a Wednesday night." It was at one of those social games that Dyantyi once again crossed paths with the persistent Masina. "I went to watch because I try to see who is up and coming," Masina said of the day he saw Dyantyi play for the first time. "He was playing fly-half. He ran everything - literally everything. I thought 'This might be a challenge', but I could see he could play. "I went up to him after the game and I said 'Tomorrow, we're training at 5.30pm, you'd better be there'. He said 'Cool, Coach, I'm going to come'. And he did." It wasn't easy going for Dyantyi from the start; he wasn't as fit as the other players, and was reluctant to give up the No 10 jersey he'd grown to love. "After practice, already I could tell that this wasn't the fly-half that I would have loved to have in my team," said Masina. 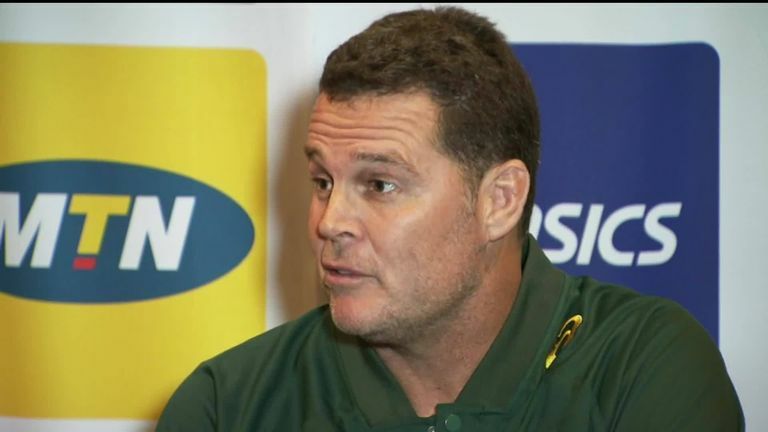 "Yes, in residence rugby you can have a fly-half that can run everything, but I didn't look at him only as an Under-19 player, I looked at him and thought 'If this guy is going to make it to the top, there's no way he's going to play fly-half'. "Nowhere in the world will you see a fly-half who runs everything, you still need to kick and control the game. Eastern Cape people, they love their rugby; they enjoy seeing the ball just being tossed around - that's their game. But we all know that once you get to a higher level it doesn't work. "I went up to him and asked him what position he wanted to play. He said 'I want to play fly-half, or else I'm not going to play'." Masina laughs as he recalls the confidence of the teenage Dyantyi. "For me, I didn't look at him and think he was arrogant. I thought if this guy knows what he wants, that's a bonus, I can work with this guy. "I said to him 'For now, we've got a fly-half, but in the next couple of games I will definitely give you a chance at fly-half'. But I knew he wasn't going to get that chance. In short, I tricked him. "I would say to him 'Run at full-back for me, I would like to see you when you come in at the second line. I want you to use your speed'. I kind of took his mind off this fly-half thing that he wanted. "Slowly but surely i would move him to full-back and shift him to wing, and create moves to make sure he got hands on the ball. Because he just wanted to play." Sitting in London ahead of South Africa's all-important Test against England at Twickenham, 24-year-old Dyantyi has fond memories of the man who guided him back to the game. "I didn't want to hear anything else besides fly-half," Dyantyi confirms of those initial conversations with Masina. "It took a couple of sit downs to try and convince me - at first I didn't take kindly to it. "I thought 'OK, at full-back I still get a lot of ball. At least I'm not on the wing. Let's give it a try.' Halfway through the season I was playing wing! "So he had a trick up his sleeve, but I'm really grateful to the UJ structures, to Coach Mac Masina personally, and the other coaches who came after him that helped me not just improve as a player, but improve as an individual. "I'm glad he had those sit downs with me, to try and help me have an open mind to things. That's how I try to approach things now." Dyantyi went on to play for the University of Johannesburg's senior team, and from there picked up a contract with the Lions, which set him on his way to an incredible breakthrough year on the world stage. That journey may still have happened had he stuck with his original decision to play fly-half - we'll never know. However, Masina says the positional switch was not just down to what his team needed at the time, but also to make sure Dyantyi wasn't heading for inevitable criticism from impatient coaches and fans. "Maybe Aphiwe will hold it against me that he wanted to play fly-half and ended up playing out wide, but watching what's happening internationally, I was being more realistic," said Masina. "Him being a youngster, he wasn't being realistic, he just wanted to play. It's like any other kid who thinks they can take over the world without knowing what's out there. "In a way I was protecting him, because if he was a fly-half who ran everything and got tackled and made mistakes, everyone would say he's no good, he can't play. Meanwhile they don't understand him and how he functions." Masina is passionate about rugby, and still plies his trade as a university coach - these days at the University of Free State - and the former Super Rugby player with the Cats is determined to make sure the game doesn't lose players in the way it almost lost Dyantyi. "I'm not saying I'm the best spotter of the players, but surely as coaches you can see talent, even if you haven't played the game," Masina said. "There are plenty of players like Aphiwe in South Africa. The people working with them just need to identify that. Once they can identify them, once they can work with the players, we will see more players like Aphiwe, trust me. "If Aphiwe didn't play first team rugby at school, where is the guy who did? Where is he now? You have to look at it that way."